The Royal Oak pub is a familiar landmark on Quorn Cross. This photograph is difficult to date and the closest we can guess is the 1940s to the 1950s. 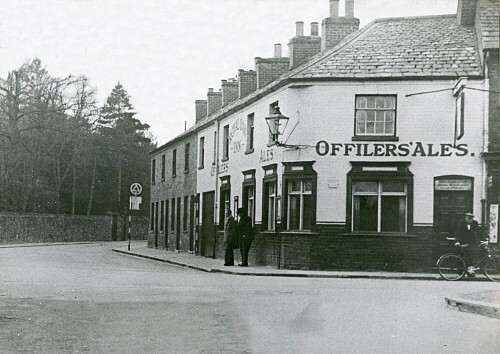 Offiler’s brewery in Derby went out of business in 1956. Can anyone provide a more accurate date? Just to the left of the traffic sign in the picture, is a gateway in the brick wall (on Meeting Street). This led to the Farnham family's stables. Graham Stocks remembers that there was an upper room where the Scouts used to meet. The photograph was kindly lent to Quorn Village On-line Museum for scanning, by Barry, who was landlord of the White Horse pub from the early 1980s. Missing information: Can you provide a better date? Where did the gate in the wall (on Meeting Street) lead to?